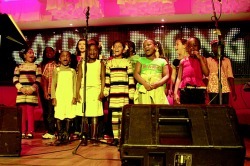 The Childrens Choir started off as a regular choir until the children decided that they wanted to be a gospel choir too. So in 2010, The Really Truly Youthful Gospel Choir were formed. They had their first performance in GLOR for Clare's Got Talent were they got to the semifinal. They sing once a month at the Mass with a Difference and at other events throughout the year. Children need to be under the age of 12 and all are welcome.